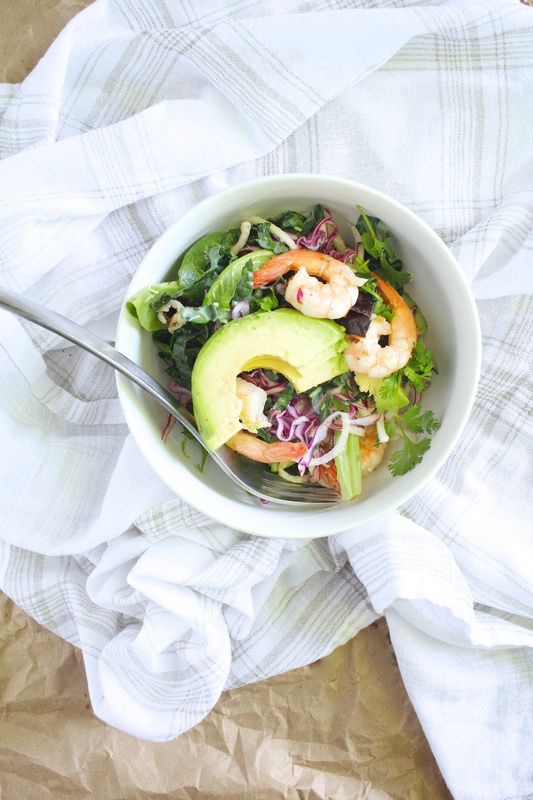 This shrimp and avocado salad is packed with lots of contrasting flavors and textures (like crunchy jicama and tender shrimp and buttery avocado) that’ll keep you coming back for more. The other day I was walking through the grocery store and my kids were hangry, so I just grabbed a huge salad for us to share. I took my chances on the shrimp salad instead of cobb, and to my surprise, they all inhaled it. Honestly, the salad was mediocre at best with the boring bed of greens and gelatinous suspiciously orange dressing, but I just shrugged and gave myself some credit for passing up hot dogs for a salad. But I was a little sad when I realized I hadn’t purchased shrimp in a long time, and added it to the following week’s grocery list, determined to do the title of shrimp salad some justice. And friends, I give you the ultimate shrimp salad. It’s full of contrasting flavors and colors and textures that work in harmony. And the dressing is extra special because it’s warmed in the skillet that you cook the shrimp in, scraping up those browned bits, and boosting the flavors of the finished salad. The warming mellows the vinegar a touch, which is really nice because it doesn’t over power the other more subtle components. Jicama is the secret star of the show, actually. And I hope I’m not giving you a flashback to the late 90’s when every mom put it in their salads, because really this lovely root vegetable deserves some more credit than that. It’s crunchy and sweet and juicy but kind of oddly crumbly and just … yummy. If you’ve never used jicama before, give it a try. I used my spiralizer, but if you don’t own one, you can julienne it either on a mandoline or with a knife. Just be careful because it is a pretty firm root vegetable, so it’ll give you some resistance. It looks like a lot to take in, but really it comes together easily. And it’s hearty, so you can serve it as a meal. I keep the tails on the shrimp and let my guests take them off themselves, but you could of course remove them beforehand. Enjoy! 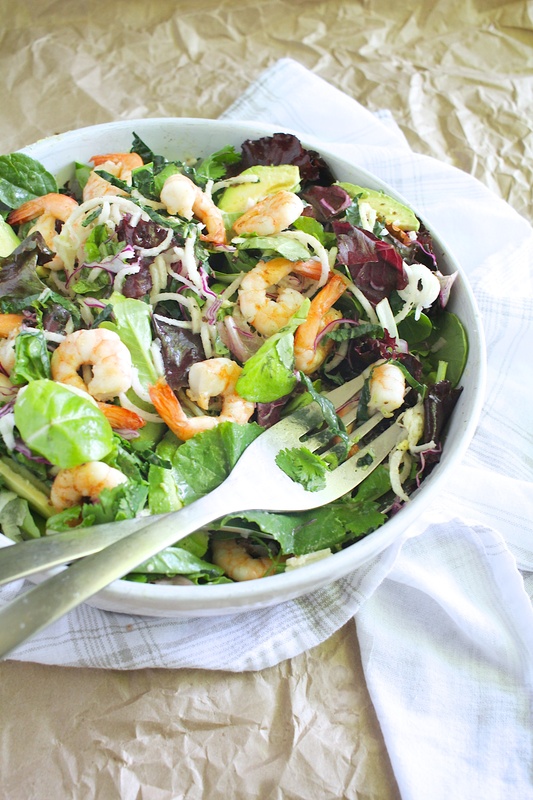 This shrimp and avocado salad is packed with lots of contrasting flavors and textures (like crunchy jicama and tender shrimp and buttery avocado) that'll keep you coming back for more. Pat the shrimp dry with a paper towel or clean kitchen towel and season with salt and pepper. Melt the butter in a large skillet over medium-high heat. Add the shrimp in one layer, making sure none touch. Once browned slightly on the first side, flip over and cook the other side. Set aside and repeat with remaining shrimp. To make the dressing, add the vinegar, garlic, extra virgin olive oil, pure maple syrup, salt and pepper to the skillet and bring to a simmer, scraping up browned bits as you whisk. Once the browned bits are removed from the skillet, turn off the heat and set aside. Combine the cabbage, kale, greens, cilantro, parsely, jicama, and avocado in a large serving bowl. Place the shrimp over the top and drizzle over the dressing from the skillet. Toss to combine and serve immediately.